significantly constraint the model parameters. We present a convolutional neural network to identify distinct cosmological scenarios based on the weak-lensing maps they produce. Modified gravity models with massive neutrinos can mimic the standard concordance model in terms of Gaussian weak-lensing observables, limiting a deeper understanding of what causes cosmic acceleration. We demonstrate that a network trained on simulated clean convergence maps, condensed into a novel representation, can discriminate between such degenerate models with 83%-100% accuracy. Our method outperforms conventional statistics by up to 40% and is more robust to noise. 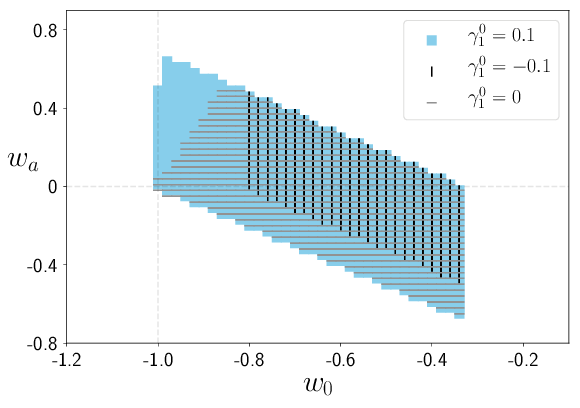 Based on the DUSTGRAIN-pathfinder suite of simulations, we investigate observational degeneracies between nine models of modified gravity and massive neutrinos. 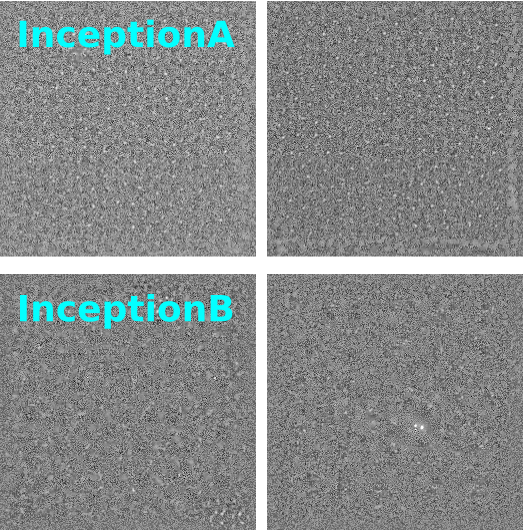 Three types of machine learning techniques are tested for their ability to discriminate lensing convergence maps by extracting dimensional reduced representations of the data. 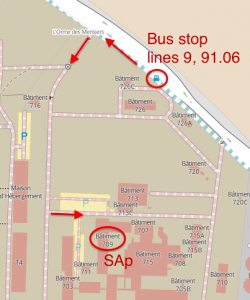 Classical map descriptors such as the power spectrum, peak counts and Minkowski functionals are combined into a joint feature vector and compared to the descriptors and statistics that are common to the field of digital image processing. To learn new features directly from the data we use a Convolutional Neural Network (CNN). For the mapping between feature vectors and the predictions of their underlying model, we implement two different classifiers; one based on a nearest-neighbour search and one that is based on a fully connected neural network. We find that the neural network provides a much more robust classification than the nearest-neighbour approach and that the CNN provides the most discriminating representation of the data. It achieves the cleanest separation between the different models and the highest classification success rate of 59% for a single source redshift. Once we perform a tomographic CNN analysis, the total classification accuracy increases significantly to 76% with no observational degeneracies remaining. 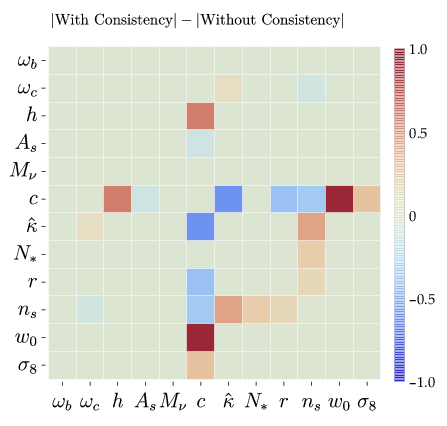 Visualising the filter responses of the CNN at different network depths provides us with the unique opportunity to learn from very complex models and to understand better why they perform so well. In the context of the effective field theory of dark energy (EFT) we perform agnostic explorations of Horndeski gravity. We choose two parametrizations for the free EFT functions, namely a power law and a dark energy density-like behaviour on a non trivial Chevallier-Polarski-Linder background. We restrict our analysis to those EFT functions which do not modify the speed of propagation of gravitational waves. 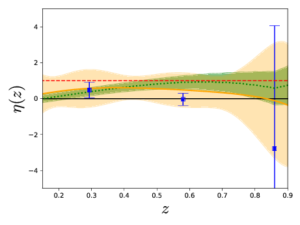 Among those, we prove that one specific function cannot be constrained by data, since its contribution to the observables is below the cosmic variance, although we show it has a relevant role in defining the viable parameter space. We place constraints on the parameters of these models combining measurements from present day cosmological datasets and we prove that the next generation galaxy surveys can improve such constraints by one order of magnitude. 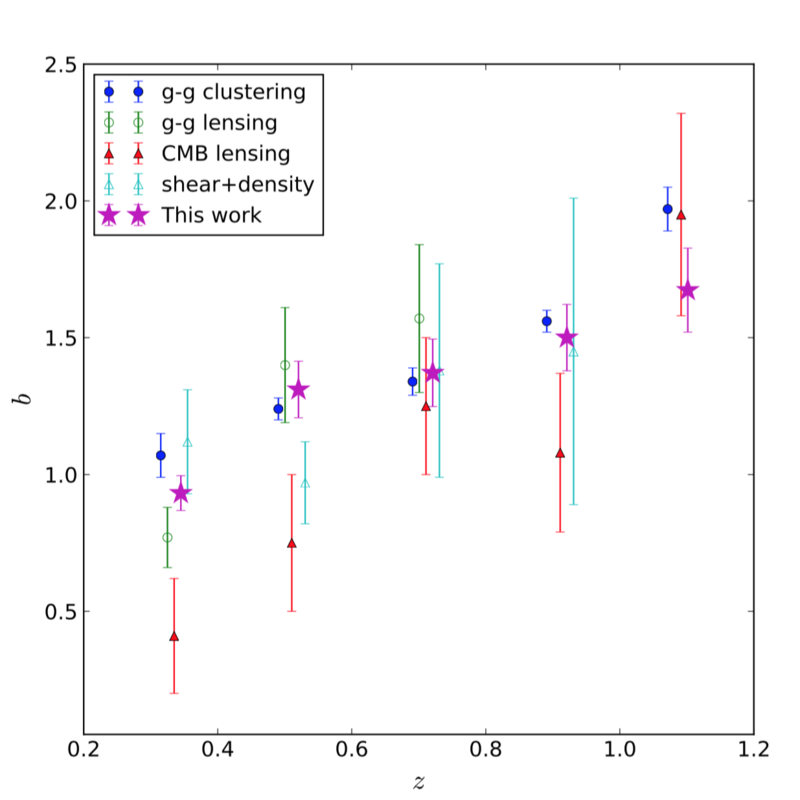 We then verify the validity of the quasi-static limit within the sound horizon of the dark field, by looking at the phenomenological functions μ and Σ, associated respectively to clustering and lensing potentials. Furthermore, we notice up to 5% deviations in μ,Σ with respect to General Relativity at scales smaller than the Compton one. For the chosen parametrizations and in the quasi-static limit, future constraints on μ and Σ can reach the 1% level and will allow us to discriminate between certain models at more than 3σ, provided the present best-fit values remain. Authors: A. I. Salvador, F. J. Sánchez, A. Pagul et al. General relativity (GR) has been well tested up to solar system scales, but it is much less certain that standard gravity remains an accurate description on the largest, that is, cosmological, scales. 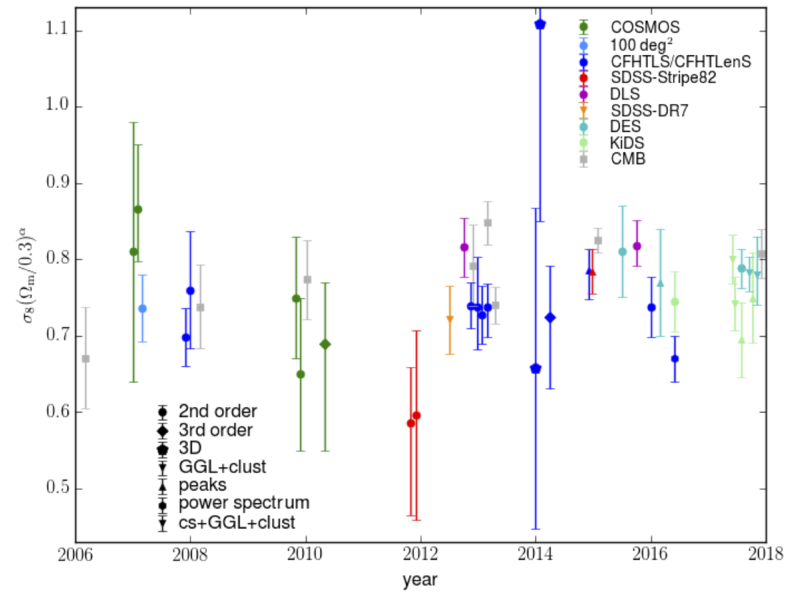 Many extensions to GR have been studied that are not yet ruled out by the data, including by that of the recent direct gravitational wave detections. 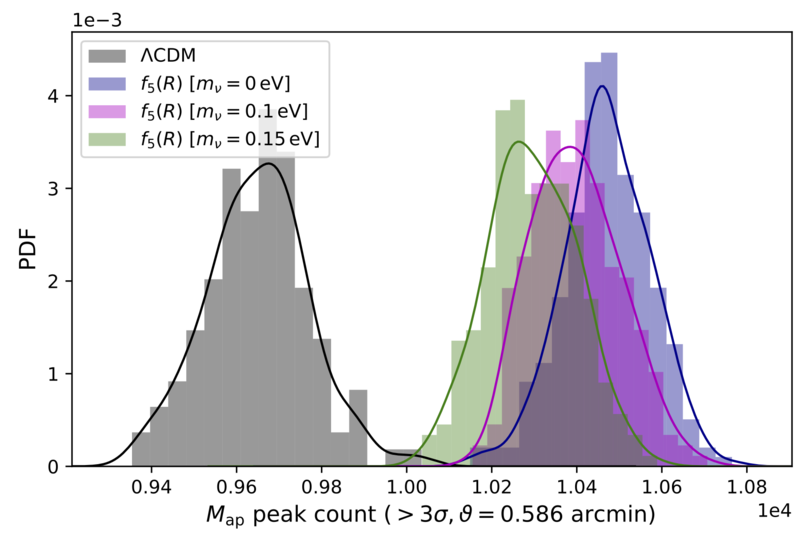 Degeneracies among the standard model (ΛCDM) and modified gravity (MG) models, as well as among different MG parameters, must be addressed in order to best exploit information from current and future surveys and to unveil the nature of dark energy. 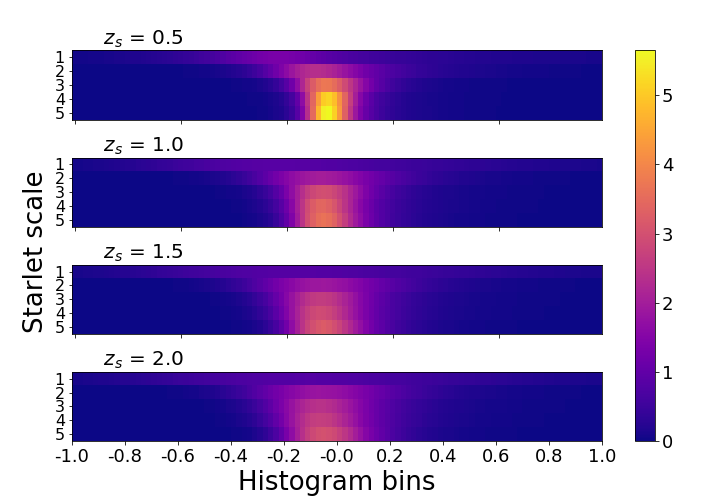 We propose various higher-order statistics in the weak-lensing signal as a new set of observables able to break degeneracies between massive neutrinos and MG parameters. 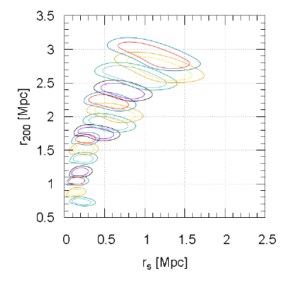 We have tested our methodology on so-called f(R) models, which constitute a class of viable models that can explain the accelerated universal expansion by a modification of the fundamental gravitational interaction. We have explored a range of these models that still fit current observations at the background and linear level, and we show using numerical simulations that certain models which include massive neutrinos are able to mimic ΛCDM in terms of the 3D power spectrum of matter density fluctuations. 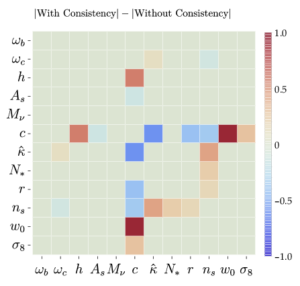 We find that depending on the redshift and angular scale of observation, non-Gaussian information accessed by higher-order weak-lensing statistics can be used to break the degeneracy between f(R) models and ΛCDM. In particular, peak counts computed in aperture mass maps outperform third- and fourth-order moments. 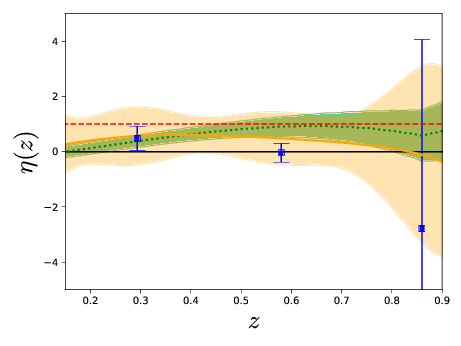 In this work, we use recent data on the Hubble expansion rate H(z), the quantity fσ8(z) from redshift space distortions and the statistic Eg from clustering and lensing observables to constrain in a model-independent way the linear anisotropic stress parameter η. This estimate is free of assumptions about initial conditions, bias, the abundance of dark matter and the background expansion. We denote this observable estimator as ηobs. 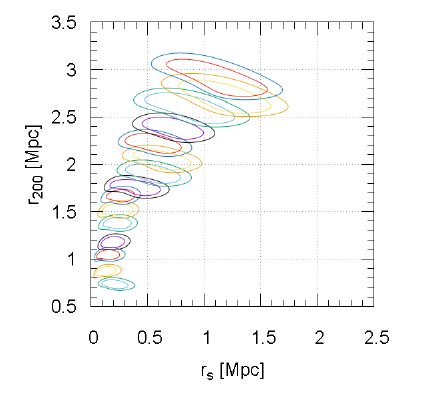 If ηobs turns out to be different from unity, it would imply either a modification of gravity or a non-perfect fluid form of dark energy clustering at sub-horizon scales. Using three different methods to reconstruct the underlying model from data, we report the value of ηobs at three redshift values, z=0.29,0.58,0.86. Using the method of polynomial regression, we find ηobs=0.57±1.05, ηobs=0.48±0.96, and ηobs=−0.11±3.21, respectively. Assuming a constant ηobs in this range, we find ηobs=0.49±0.69. We consider this method as our fiducial result, for reasons clarified in the text. The other two methods give for a constant anisotropic stress ηobs=0.15±0.27 (binning) and ηobs=0.53±0.19 (Gaussian Process). 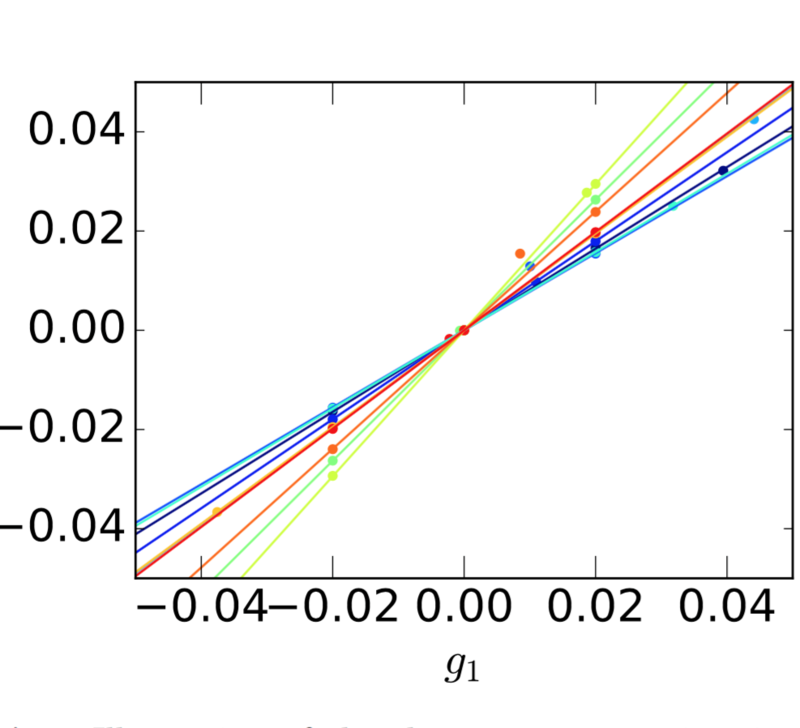 We find that all three estimates are compatible with each other within their 1σ error bars. While the polynomial regression method is compatible with standard gravity, the other two methods are in tension with it.